It’s rare when you can find a product that features the highest quality and best design in its category, and it costs far less than most of the comparable products out there. But that’s exactly the case with the Nanch Small Precision Screwdriver Set. It sports a terrific all-metal design with a telescoping handle for those hard-to-reach places, and it comes with 22 steel bits that are all magnetized so you don’t drop any screws. It’s only $19.99 on Amazon and you won’t find anything as good even for twice the price. Ergonomic Design Handle:Anti-slip area with free spinning cap for precise turning and control with finger,telescopic driver for longer slender reach. High Hardness Performance Bits:Full metal driver with 22 bits made from alloy S2 steel – HRC60±2, hard heated treatment finished. 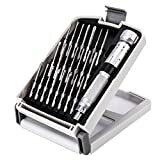 Multi-use Screwdriver Set:small repair kit for small electronics,eyeglass,laptops,phones,computer,eyeglasses,smartphones,toys,iPhone,PC,watches,game consoles,Macbook air and most handheld devices.